On the evening of August 19th, 300 participants in the 24-hour filmmaking competition in Toowoomba, Australia awaited eagerly for the awards of the 2012 Origin8 Fast Film Festival to be announced. Each team (of the 300 participants) had received a list of 8 objects they had to integrate in their film including a musical instrument, someone reading, a record, a sock, a roundabout, unlocking, a bus stop and hairspray. Out of the 44 teams involved in the competition, one team stood out above the rest. Two sets of homeschooled brothers, Ryan and Connor Grzesiak and Judah and Asa Simard, were awarded with Best Fast Film of the Festival. 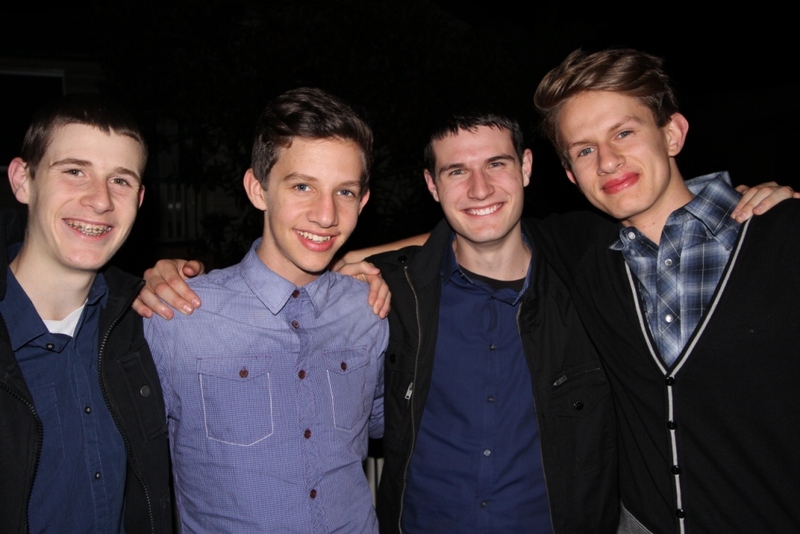 Their film, The Remorse, also received awards for best under 18 team and best sound design. Through determination and constant prayer, the team worked tirelessly over the 24-hour period to shoot and edit their film. Read on for interview with Connor Grzesiak about his and Ryan’s passion for creating thought provoking films, their excitement to start new adventures in the world of Christian film and the underlining theme of God’s guidance in their lives. 1. How has homeschooling (vs. going to public school) helped prepare, as well as provide you and Ryan with extracurricular activities, camps and whatnot? First of all, homeschooling has provided us with an outlet from which we can focus on areas we enjoy and work on developing our independent ventures. We have the freedom to pursue our interests and work in an environment that is void of peer pressure and its discouragements, enabling us to directly improve our knowledge and abilities on a subject. In addition, homeschooling provides the flexibility to “alter the schedule” and vary our times of involvement in something. In the case of our film, we were able to pack our equipment and drive to the town for the weekend and then come right back and continue our school. Furthermore, homeschooling allows individuals to mix with other age groups. We are almost like one big family, building one another up and encouraging each other’s gifts and talents. Rather than confining our social life to friends of the same grade, our siblings and the siblings of our friends are just as important in our relationships. 2. Tell me about the Film Competition. Where did you first hear about the competition? What were some of your initial thoughts when you heard about it? Ryan and I first heard about the competition from our filming mates, Judah and Asa, who knew one of the contestants. Immediately we latched onto the idea, and eagerly prepared to drive up to a town (2 hours away) to make a film. From past experience we had learned that as a film team, we work better under a time constraint. This competition was a good opportunity to challenge our ability to effectively convey a message through film as well as to work in a more professional environment. A few months before, we had joined a Christian film production in the same town (Toowoomba) where we helped in the making of a feature film called The Custodian that was to be shot in a week. The director would often pull us aside to explain what he was doing and was always excited to inspire us toward thought-provoking messages. He definitely made an impact on our team, and we had left the set enthusiastic and determined to lift our standards in our future films. When we filmed our movie, we stayed at the house of the visual effects designer from the Custodian who we had met on set. Our initial thoughts were ones of anticipation as this would be the first professional competition we had ever been in. Never did we think we would reach the top eight, let alone winning the competition. It was all about the experience and the fun we would have in doing it. In addition, we saw this time as a great bonding period for the team. 3. What where your overall thoughts about the film competition and how your film, The Remorse, turned out? In short, the film was a miracle. In record time, after having a short bible study, we were able to piece together the plot in around an hour. Usually, developing plots, especially complex ones, take time to think through their complexities and how all of the elements work together. That was our first miracle. Immediately after getting down the plot, we gathered our equipment together and ran out to the roundabout where we filmed to about 1:00 in the morning. Countless cars were coming through and the wind was freezing cold; however, after we had a short prayer, they just seemed to stop. The next day, we focused on filming all of the other scenes that the main character would go to. Many times obstacles arose, but soon surpassed after prayer. Indeed, faith like a mustard seed really became a reality for us. When we finally arrived at the editing room, we were feeling confident in our time span. Unfortunately we met a small crisis when some of the scenes did not seem to flow well with the plot. We had the huge decision to go out and try to film or work with what we had. We were all discouraged. Nevertheless, we decided to stick with what we had, and in no time the scenes were pieced together and the editing began to look possible. As the time ticked, we worked hard cutting together the movie, adding music and sound effects, and rendering out the film. We arrived at the house a half an hour before the deadline. Surprisingly, we heard that we were one of the first. Our hope was reassured. The next day, we headed to the theatre where the announcements were to take place. The theater was huge and quite intimidating. Seeing all of the other teams arriving, our doubts returned. Before the judges made their final decision, they showed the top eight films. Ours was the seventh, and it renewed our confidence and hope. We were overjoyed just to be in the top eight. Before the announcement, we prayed and left it in the Hands of God. And then it happened. “Winner for Best under 18 team – Eyekey Productions.” We were ecstatic! “Winner of Best Sound Design – Eyekey Productions.” This was beyond what we had hoped for. And then when the Winner of the Year was just going to be announced, I remember sagging into my chair with joy inside and ready to applaud the winner. Little did I know it would be us. As we waited, Judah (the main actor) turned to me and whispered in my ear, “Just give it all to God.” At the exact time he said that, we heard a familiar name called out, “Eyekey Productions!” God was truly at work and had blessed us in such an unexpected way. Wow, it was like we had truly moved mountains! The rest of the night went like a blur. We were interviewed by several local news channels as well as an interview for the next year’s competition. We were just as excited to share of God and his work, then what we had done. Really, it was His film; we just helped Him make it. This single event became a new beginning for our film production, Eyekey Productions. Since then, we are working toward other thought-provoking films that will challenge society and work to the Glory of God. God has a unique purpose for us; it’s just how we go about it that counts. And as for that mustard seed? Well… let’s just say that it is much bigger. Still small, but growing. What is faith if there is no obstacle to surpass? We learned that as much as we want God to be “a part” of our film, God is our fifth teammate. Photo: (L to R) Connor Grzesiak, Asa Simard, Ryan Grzesiak, and Judah Simard.